As e-commerce accelerates and consumer habits change, search engines are fast becoming shopping marketplaces in their own right. Retailers dominate results and are now favored in search results. It’s time to re-evaluate your search strategy. E-commerce continues to grow at an accelerated rate. The rise of mobile-based shopping and the cementing of large scale events like Black Friday and Cyber Monday has meant that online retail on e-commerce platforms has increased year over year in the past decade. In the last two years, the margin of increase has amplified even further. Online still accounts for less than a sixth of all retail sales in the UK, meaning there is still plenty of room for growth. 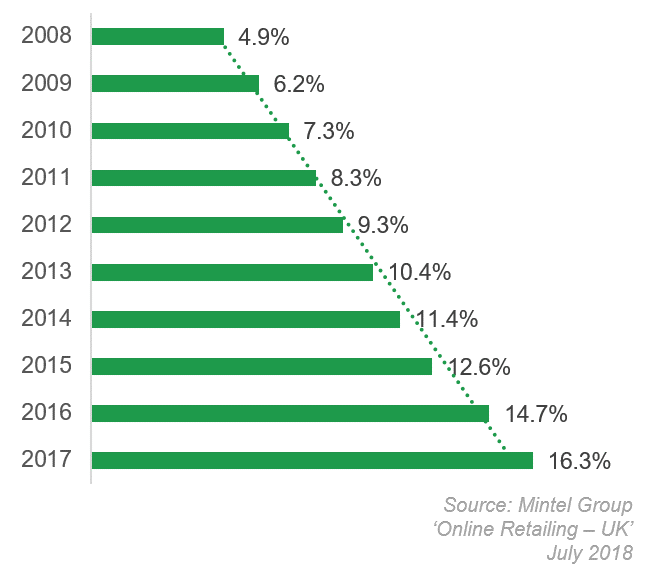 By 2023, online sales are predicted to grow even further, to an estimated share of around 26% of all UK retail sales (Source: Mintel, Online Retailing UK, July 2018). There may be an ultimate ceiling for e-commerce, but we are far from it. Huge sectors such as the Electronics industry have already seen the majority of spending migrate to online channels, while others like Grocery remain in a relative sense of infancy in terms of online development. There has been a seismic shift in the way we use search engines. No longer is the search engine a place primarily for information – it has become a marketplace in its own right. It has become more and more important for e-retailers to achieve an integrated approach to advertising across both paid and organic search, as well as shopping listings (PLA). In a study compiled by collecting data on Google SERP using Publicis’ search engine monitoring technology, we looked at a landscape view of websites appearing against TV related keywords in the UK on Google desktop and mobile listings. 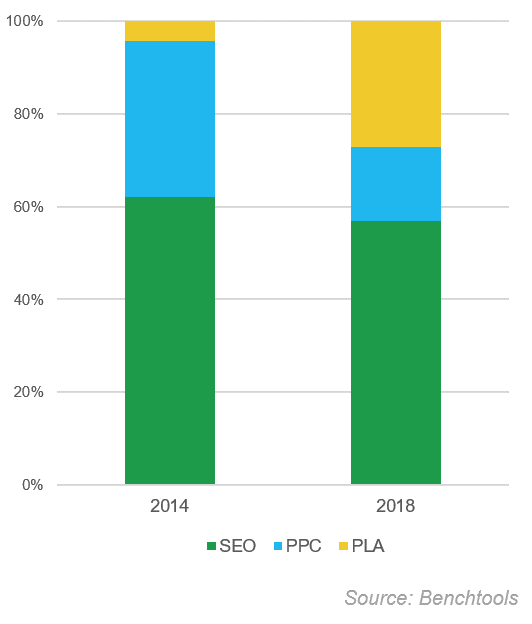 The analysis was conducted across PPC, SEO and PLA formats and the data was taken over a month period (May-July) in 2018. Data from the same period in 2014 was pulled to serve as a comparison. What was evident was that the shopping listings (PLAs) have become increasingly prominent. In 2014, they accounted for less than 5% of ad coverage on the SERP. Today that figure is nearly 25%. Traditionally, the assumption is that retailers will focus their search investment and optimisations on the latter stages of the conventional purchase funnel – as there is said to be a higher level of purchase intent here. Retailers are beginning support the notion that searches in the primary stages of the purchase intent funnel ultimately can, and do, lead to purchases. Taking a similar approach to the analysis we conducted on the differences between the SERP in 2014 against 2018, we used ‘running shoes’ related search terms and monitored paid and organic listings; we split these keywords by purchase intent funnel, and monitored websites appearing against them. The results in the ‘purchase’ end were as we expected, with retailers accounting for 95% of PPC and SEO coverage against these keywords. What we noticed, however, was that for ‘awareness’ search terms across PPC and SEO, retailers account for 60% of overall coverage on the SERP. The search landscape in 2018 includes more retailers than ever before and merchants are present across all three listing types on the results page. The fact that they are ranking organically against these search terms indicates that Google’s search results relevancy algorithm is in favour of retailers occupying these positions. As expected, for shopping ads, retailers account for 86% of listing coverage. The remaining 14% represents brands. For paid search listings, retailers make up 57% of all advertiser coverage for TV awareness keywords, while brands account for 42%. For organic search, retailers account for 45% of all coverage at the awareness stage of the purchase intent funnel. Brands make up 7%, while reviews/comparison sites provide the remaining 48%. 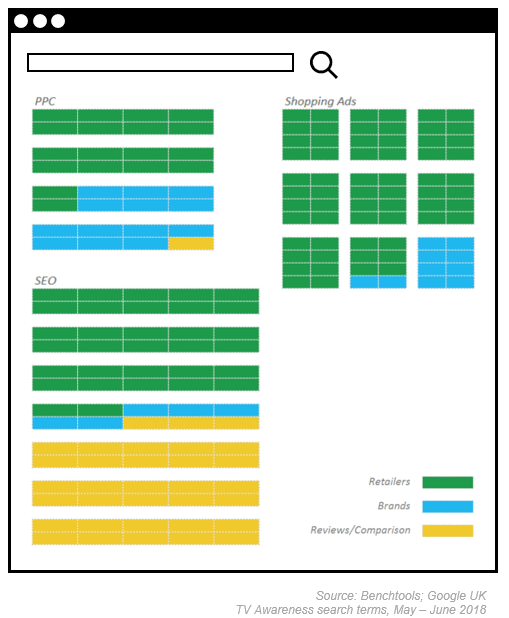 This analysis underlines the emerging dominance of retailers on the SERP. Google is beginning to prioritise retailers on SEO listings, and retailers are bidding aggressively on PPC listings. While there are several conclusions that may be made from these data, it is important to put these findings into context. Results may vary across different verticals and studies. The Strategy and Consultancy team at Performics is able to produce similar analyses, providing an in-depth study of the search space, and explore a brand’s position on the SERP as well as within retailer’s pages. This, in turn, will help inform the strategy and media buying.